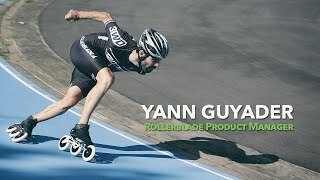 Inside the Brand with Yann Guyader: Rollerblade® Product Manager. Skating is accelerating fast: a form of transportation that is getting more and more attention from around the world. Whether you are maintaining fitness, working towards a healthier lifestyle, challenging yourself to set a new personal record, or enjoying some time alone, Rollerblade® products are there to suite your inline needs. At Rollerblade® we work with passionate people who love skating. Innovation and new product design is essential for the future of skating. Our research and development offers you, as a skater, the most versatile and perfect skate for whatever your particular genre of skating might be. Therefore we would like to introduce Yann Guyader: Product Manager at Rollerblade® in Italy. Q. Yann the roots in skating run deep in your family, when did you start skating? A. I started in 1992 at club that my grandfather created after World War II. At the time I was living next to the banked track, so it was natural for me to start inline skating. Q. Fast forward in your skating career. You skated at a professional level. What is your best memory? A. I’ve been skating at a professional level for about a decade. My best memory is the overall World Inline Cup victory in 2008, when the marathon series was still the pinnacle of speed skating, well beyond world championships. It was an outstanding performance to beat the reigning champion, Max Presti (Italy), who had won the last four years in a row. Q. When did you start as Rollerblade® product manager? How does your professional career help you in this position? A. I started working at Tecnica® headquarters in July 2015. Everything started when I met Sami at a race in Switzerland (2014). I was finishing my Masters degree at that time and was just skating for fun. He told me that Rollerblade® was looking for some new faces. I got in touch with them and after a while we decided to work together. My career as a professional skater is, of course, an asset as it allowed me to build strong experience over the years and have the required knowledge as product manager. My network within the inline world is also a key to success. Q. As a skater you are still a consumer of the skates. How does this help you develop new products and stay innovative? A. Of course being innovative is key to keep our number one position in the industry. This is why we always try to think out of the box. We do not only create new concepts based on our experience. We also get inspiration from other brands, working in the avant-garde of their business. Cycling brands, running brands, and clothing brands are always inspiring. In order to make sure that we always keep going in the right direction, I test the products myself throughout the research and development process. I also rely on a team of strong riders and athletes that help us bring forward all the new projects and innovations we need for our products. Q. Skating has made a huge progression since the late eighties/early nineties. What has had the biggest impact on you? A. I believe that the biggest evolution was the switch from Quads to Inline skating. This was a true revolution and not only an evolution. It opened many doors, and allowed inline skating to boom all over the world and have huge events broadcasted on TV ( X-GAMES, UNIVERSAL STUDIO MARATHON, etc.) It happens that Rollerblade® is the originator of inline skating and this is why we have to be worthy of the legacy. Q. At Rollerblade® we encourage challenging yourself and staying healthy. How do you stay in shape? A. I mainly run, as we do not have any skating facilities around the factory. Nonetheless, every time I get back home, I bring my skates and enjoy a nice ride at the track.